Q: Are there any on-campus apartments for students? 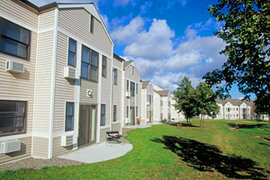 A: The Circle and Garden Apartments are fully furnished, independent living options for students who have completed at least one year at Ithaca. The Circles are air conditioned, carpeted, private-entrance units, while the Garden Apartments have a small kitchen, bathroom, and living/sleeping area, and either a patio or balcony. Incoming students may live in a single, double, or triple room in any of the other residence halls on campus. You may also apply to participate in the First-Year Residence Hall Program.